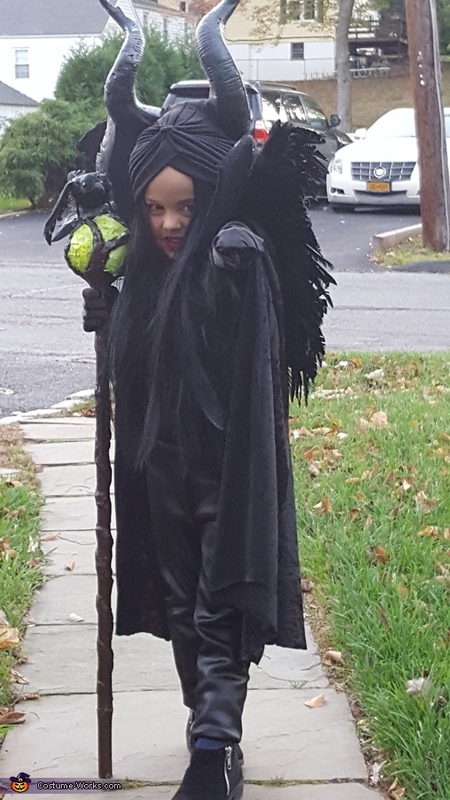 My Daughter Brooklyn who is 4 loves maleficent so she asked to be her for Halloween. I do not buy costumes so I made it. I drew a outline of the horns and cut them out and shaped out of foam from Michaels. then I wrapped them with electric tape and painted them with two layers of black. I put them on a wide headband with hot glue and sewed them for extra secureness. I bought a child's black wig on amazon along with a black cap. The cap I disassembled ( it was a adult one) I cut it down to kids size and re sewed. I slit two holes in top of cap to pull horns through so that the headband would stay with all the walking. My grandmother had a velvet/ velour material coat that I used for the fabric for the cap. I used a foam type material from Michaels craft dept. and cut two winged pieces and glues together to form the shape of the collar. I cover that with a black t-shirt I had that I do not wear and I sewed the collar to the cap. Her pleather pants and body suit I bought on amazon also. Her staff was a piece of bamboo that a scarecrow I had was attached to. I cut the scarecrow off and uses the stick part. I stuck a foam ball from Michaels on top. I coated the ball first with a dryable clay and then rolled out clay and wrapped the stick part to look like a branch type ridge. then I pained the whole thing brown and rolled out a few sticks of clay and layered over ball to look like the ridging on ball. then I used glow in dark paint a layered it for dimension . I bought a fake crow at Michaels also and glue gunned it to ball. her gloves were kid black long wedding gloves that I cut fingertips down and sewed so that they were small enough to fit. the wings I purchased from amazon. I had two slits in cape back to pull wing loops through so the wings looked attached to her .